Each slide displays for 10 seconds. To pause the slideshow, hover your pointer over a slide you want more time to read. Click on this brief video to learn more about my plan to end the school funding gridlock in Olympia. 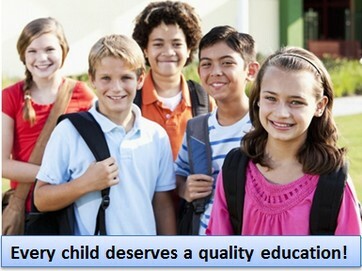 As a parent and teacher, I believe that every child deserves a quality education. It is the paramount duty, not only of the state legislature, but of every citizen to make sure that our public schools are fully funded so that our kids can succeed in school and succeed in life. Having a Master's Degree in Child Development, I understand how crucial it is that each and every child has an experienced teacher and a safe and secure school environment. As an educational researcher, I also realize that our public schools are the foundation of our democracy, the key to our ability to innovate and the basis of our economic prosperity. I have therefore spent the past 8 years advocating for school funding in Olympia. Prior to that, I spent 20 years teaching problem solving and conflict resolution skills at Bellevue College. What I have learned from the past 8 years in Olympia is that what politicians actually do is often much different from what they say they will do when they are running for office. A June 30, 2012 study commissioned by the legislature, called the Compensation Technical Working Group Report, found that it would take $6.6 billion per year in additional revenue in order to fully fund our public schools. This amount includes $2 billion per year in local levy funds that must be replaced by state funds. But it did not include $4 billion per year in state school construction funds that would be required to build all of the schools needed to lower class sizes. Nor did it include $4 billion per year needed to fully fund vocational training and higher education (which is also required by our state constitution). Thus, the total additional revenue needed to fully fund our public schools is more than $15 billion per year. The legislature has failed to act on these recommendations ever since. See page 49 of the following report. With the help of a few legislators who actually care, I have written and submitted several bills that would have provided billions of dollars to fully fund our schools - typically by rolling back billions of dollars in tax breaks for various wealthy multinational corporations. These school funding bills never even got a hearing - much less a vote. What I learned from this experience was that what is really important in Olympia is not funding schools - it is passing tax breaks for wealthy multinational corporations. Sadly, when billions of dollars are diverted into tax breaks for the rich, nothing is left to fund our schools. I have also watched with dismay as the legislature year after year ignored the orders of our Supreme Court to come up with a plan to restore funding for our public schools. In January 2012, the Washington Supreme Court found the legislature had failed to comply with their oath of office to uphold our state constitution by failing to comply with their paramount duty to fully fund our public schools. What did they legislature do? The cut more funding from public schools! 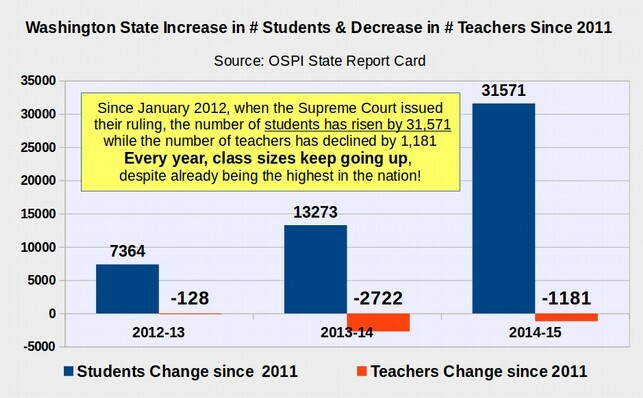 In fact, since the 2012 Supreme Court ruling, the number of students in Washington state has increased by more than 30,000 students while the number of teachers has declined by more than 1,000 teachers! 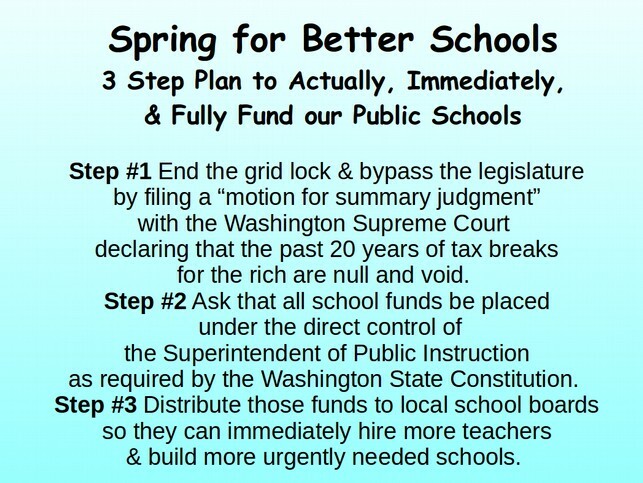 In response to the legislature's failure to comply with the 2012 Supreme Court ruling, in September 2014, for the first time in state history, the Washington Supreme Court found the legislature in "contempt of court" and gave them until July 2015 to come up with a definite plan to fully fund our public schools. In August 2015, our Supreme Court actually began fining the legislature $100,000 per day for failing to fund our schools. What was the response of the legislature? Not only did the 2016 legislature not fund our schools, but they refused to even pay the fine (which is currently at $30 million). Most in the legislature admit that it will take billions of dollars to restore school funding to what it was 20 years ago. But they refuse to submit a single bill to come up with the billions of dollars. In fact, every year, the legislature makes the matter even worse by passing even more tax breaks for the wealthy! 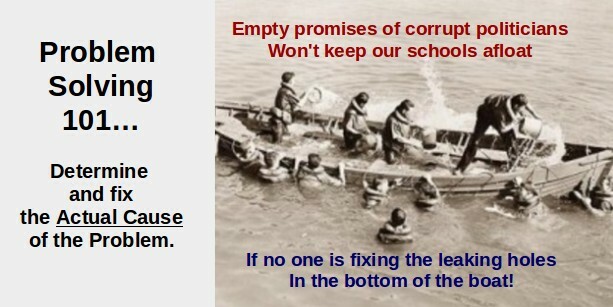 Imagine our school funding is a boat full of holes called tax breaks. The following image is how I see what is currently going on in Olympia. The problem is not merely that no one in the legislature is even trying to address the leaking holes. It is that there is a complete lack of honest leadership. So this is the current problem: What can we do as citizens about a corrupt legislature that refuses to comply with a direct order from our Supreme Court to fully fund our schools? This failure to even acknowledge the root cause of the school funding problem not only applies to the state legislature but also to all of the current candidates running for Superintendent. One candidate (Reykdal) claims that adding a capital gains tax would be the best option for funding schools. But this new tax would only add $100 million in state revenue - a small fraction of the $9 billion actually needed just for our public schools. Another candidate (Jones) wants to return all of the Lottery money to school funding. But this is also only $100 million. Another candidate (Seaquist) proposes to convene yet another education funding committee. The other candidates offer no plans at all. One option to ending the Education Funding Gridlock in Olympia would be to replace the current group of fake education advocates in Olympia with real education funding advocates. The problem with this option is that corrupt incumbents typically get ten times the funding from their corporate sponsors for their re-election campaigns as challengers. Incumbents also have much better name recognition than challengers. This is why incumbents win more than 90% of all elections. For this option to work, we would need to elect at least 20 real education funding advocates in the Senate and 40 in the House. Each of these 60 people would need to win elections despite being outspent 10 to 1. This huge change in the make up of our legislature has happened only one time in the history of our state - in the 1932 election in the middle of the Great Depression. It is not likely to happen again in our lifetime - meaning that without some other option, our kids are not likely to see full school funding at any time in their school careers. Therefore, the only real solution to this Education Funding Gridlock problem is completely new leadership in Olympia. That is why I have decided to run for Superintendent of Public Instruction. I have developed a plan that will immediately and fully fund our public schools despite the corruption in Olympia. 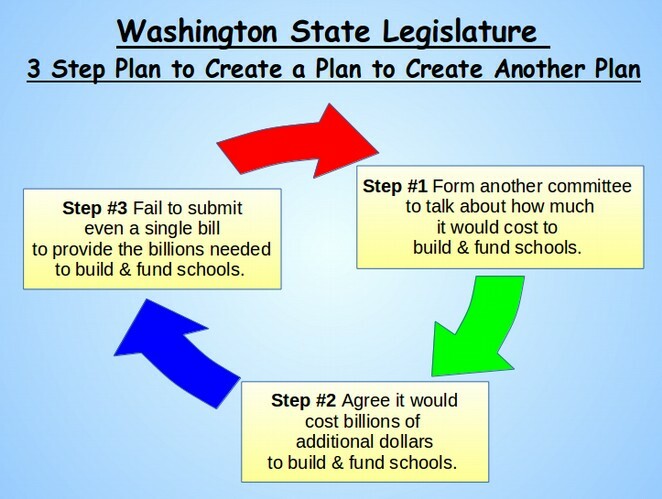 To understand how this revolutionary school funding plan works, we need to begin with a quick review of our state constitution as well as gain a better understanding of the level of corruption that has been going on in Olympia for the past 20 years. Fact #1: The Washington State Constitution has the Strongest Protection for School Funding of Any Constitution in the Nation. Because of the importance of public schools to the future of our economy and the future of our democracy, in 1889, the drafters of our Washington State Constitution made funding our schools the "Paramount Duty" of our State legislature. 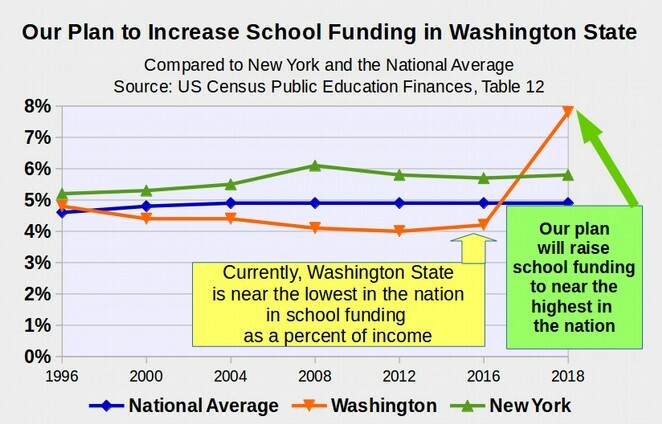 As a consequence, our state used to be near the highest in the nation in school funding - and because of our past support for public schools, Washington became one of the most prosperous states in the nation. So why is it, despite the fact that we live in one of the wealthiest states in the wealthiest nation in the history of the world, Washington students are now forced to endure some of the lowest funded and overcrowded schools in the nation? Why is it that our teachers are among the lowest paid and most over-worked in the nation? Why is it that over half our schools are so old and run down that they do not meet health code or earthquake standards - literally endangering the health and safety of our children? Why is it that despite a direct order from our Supreme Court, our State legislature has refused to honor their Constitutional Paramount Duty to fund our schools? The answer to all of the above questions is that, for the past 30 years, there has been a war against our schools, our kids, our economy and our democracy - waged by the wealthy few using deceptive terms like "Trickle Down Economics" and "Education Reform." The wealthy claimed all we needed to do was simply give them billions of dollars in tax breaks and let them run our schools, our economy and our democracy - and everything will be OK. Instead, all we have gotten from 30 years of corporate welfare for the rich is 30 years of misery and political corruption. The refusal of our state legislature to fund our public schools is just the latest chapter in this war. As a result of Trickle Down economics and massive tax breaks for the rich, here in Washington state, wealth and power are now concentrated in the hands of a few billionaires. The five wealthiest people in our state have more wealth than the bottom five million families. Yet the bottom five million families pay state taxes at a rate that is five to ten times higher than the wealthy pay. 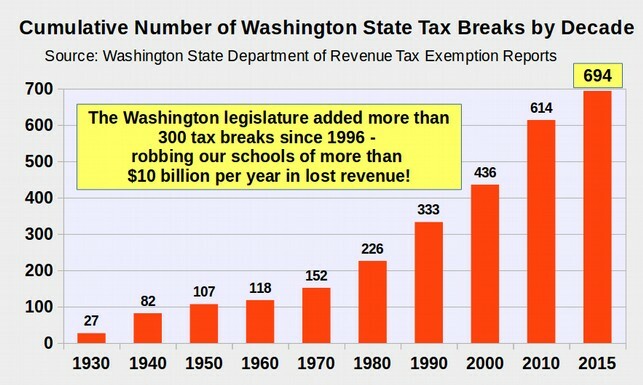 Washington state now has the most unfair tax structure in the nation. Our state is a literally a tax haven for billionaires and wealthy corporations. In fact, our state gives away $36 billion per year in tax breaks each year that go almost entirely to the very wealthy. This unfair tax structure is why we have among the lowest funded, most over crowded schools in the nation. But it hasn't always been this way. 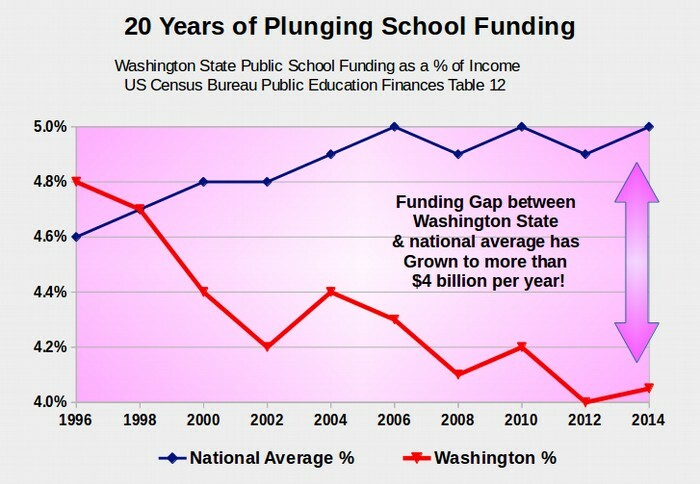 Back in 1996, the last year Washington was above the national average in school funding, tax breaks for wealth corporations were "only" $20 billion per year. But in the past 20 years, these out-of-control tax breaks for wealthy corporations have skyrocketed to more than $36 billion per year. 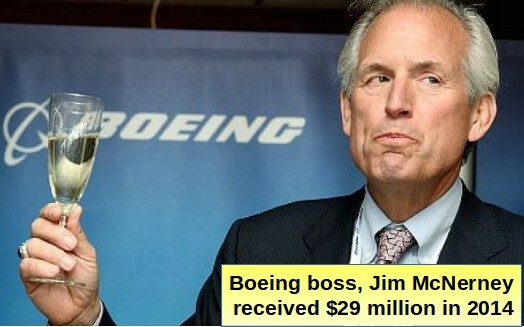 These tax breaks are crazy because corporations like Microsoft and Boeing make more than $20 billion per year in profit. If we required them to pay their fair share, it would not hurt them because they could deduct their state taxes from their federal taxes. Moreover, these tax breaks have not created any jobs! So all these tax breaks really do is rob from our kids and our schools. Our kids deserve better than this. If we insisted that billionaires and wealthy corporations pay their fair share of state taxes by rolling back out of control corporate tax breaks to what they were in 1996, we could double school funding, cut class sizes in half and provide our kids with the the best funded schools in the nation. In addition, we could provide every high school graduate with a free college education. While national average school funding is about 5% of income, school funding in Washington state is about 4% of income. Rolling back corporate tax breaks to 1996 would allow us to increase school funding by $12 billion per year which would raise us up to about 8% of income. This would put us up near the best in the nation in school funding. Some might say that $12 billion per year is too much for school funding. In fact, the legislature itself promised to increase school funding by $7 billion per year way back in 2009. This $7 billion per year did not include inflation or school construction and repair. Adding these brings the total to $12 billion per year in additional school funding that the state must provide in order to meet the McCleary Court Order. Some might say it is not realistic to expect our Supreme Court to roll back 20 years of unconstitutional tax breaks. However, in their June 12, 2014 ruling on page 4, the Supreme Court specifically noted that they have the power to "prohibit expenditures on certain other matters until the Court's constitutional ruling is complied with." Tax breaks are expenditures. The Supreme Court can also invalidate unconstitutional laws - and these tax breaks are unconstitutional laws. 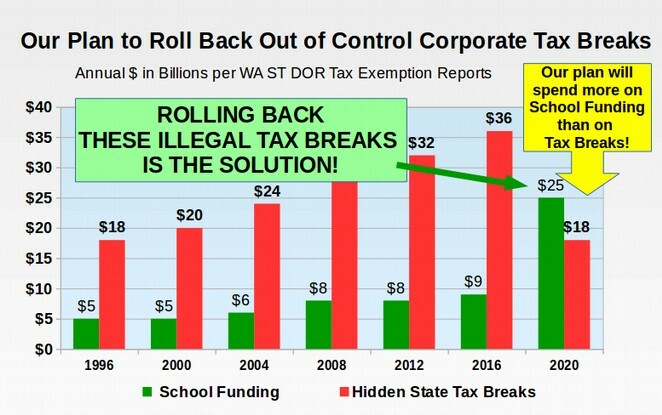 Both the plaintiffs in the McCleary case and at least one Supreme Court Justice (Justice Johnson) have proposed rolling back all of these illegal tax breaks. As Superintendent, I will ask the Supreme Court to do what they are already considering doing - to immediately repeal at least the past 20 years of illegal tax breaks. Thus, as you can see, the cause of our school funding crisis is obvious and the solution is just as obvious. So why are our kids still forced to endure the most over-crowded schools in the nation when over-crowded schools mean that struggling students do not get the help they need to succeed in school and succeed in life? Fact #4: Despite a direct order from our Supreme Court, politicians in Olympia have refused to even consider a bill to restore school funding. The best the 2016 legislature could do was to kick the can down the road for one more year with a flimsy promise to come up with a plan to fund the schools next year. The simple fact is that Olympia politicians are so corrupt that they have turned their backs on one million students in order to protect a monstrous, outrageous and illegal $36 billion per year in tax breaks for billionaires and wealthy corporations. Fact #5: If the legislature refuses to fund our schools, it is up to us to come up with our own plan to fund our schools! Like most parents and teachers, I have waited patiently year after year for politicians in Olympia to comply with their Constitutional Paramount Duty to fully fund our public schools. But as yet another legislative session comes to an end, all we got from Olympia was another fake committee. We, parents and teachers, are deeply disappointed that politicians in Olympia have once again decided to kick the can down the road for yet another year. 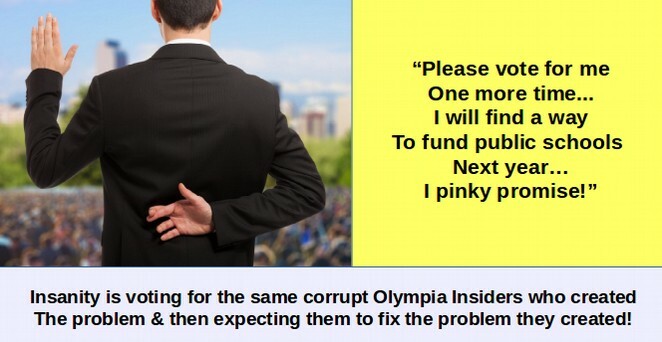 Every year, all that comes out of Olympia is more lies, more scams, more excuses and more tax breaks for the rich. Our kids need more than accounting tricks and gimmicks. They need school funding that is ample and sustainable without placing an even greater financial burden on families who are already struggling just to put food on the table. We are fed up with empty promises and double talk. Our kids do not need another committee. They need lower class sizes. Our kids do not need more excuses. They need more teachers. If other states can find a way to fund their public schools, why can't we? In a word, it is called corruption. We need to recognize that the current group of politicians in Olympia are NEVER going to fund our public schools. Here is my solution to the school funding problem. The first step in solving any problem is admitting that the problem exists. We need to admit that we have a problem with corruption in Olympia. We need to admit that the current state legislature is NEVER going to fund our public schools. We need to admit that wealthy corporations and billionaires basically run Olympia. The corrupt bribery and kick back system of campaign contributions and tax breaks for the rich paralyzes our State legislature. It is a corrupt system that robs from our schools to pay off wealthy corporations who elect politicians in Olympia. The politicians who created this corrupt system are not about to end it. Therefore, we need to find a way to go around these corrupt politicians. It is because of the corruption in the legislature that we need to come up with a plan that does not involve trying to pass a bill in the legislature. This is exactly what I will do my first day in office - go around the state legislature and directly to the Supreme Court with a Motion for Summary Judgment and Declaratory Relief to immediately declare every tax break passed since 1996 to be null and void and to place the entire school fund under the direct control of the Superintendent of Public Instruction. A motion for summary judgment is appropriate when all of the facts of a case have been decided and the only questions left are questions of law. In the McCleary case, the facts have already been determined by the trial court and it was found that the state has failed to comply with their paramount duty to fully fund public schools. The only question left is a question of law. What should be done to force the state to comply with the court order to fully fund public schools as required by the state constitution? In other states, such as New Jersey, Arizona and Kansas, the State Supreme Court ordered all public schools to be shut down in order to get the legislature to fully fund schools. There are problems with attempting this "nuclear" option in the present case. First, the amount of revenue needed is much greater than in the other states - the revenue needed was admitted by the state in court in 2009 to be $7 billion per year excluding inflation or school construction. This means that the revenue now needed to comply with McCleary and the State Constitution is about $12 billion per year which would more than double state revenue spent on education in Washington state. Second, we have a split legislature in which the leaders of the Republican party in the Senate have insisted that school revenue come from gutting all other state services while leaders of the Democratic Party in the House have refused to come up with any revenue plan for fear of not getting re-elected. The corrupt leaders of both parties have not only protected tax breaks of the rich, they have actually extended and expanded them. 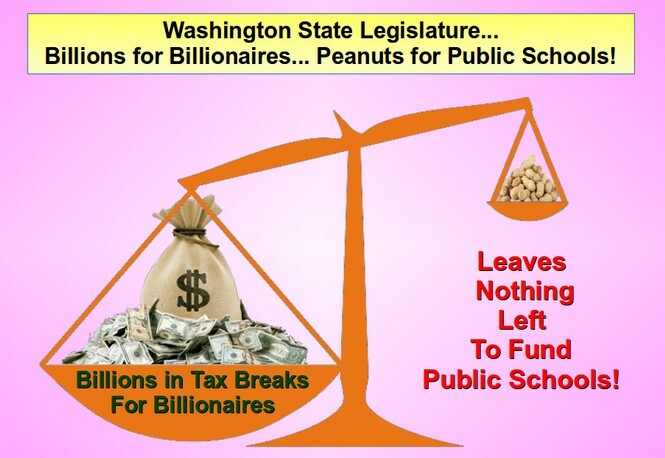 Thus, shutting down public schools with a corrupt legislature could result not only in a continuation of gridlock in Olympia but also result in cutting billions of dollars from other essential state services simply to open the public schools. A far safer option for funding schools while preserving other essential state services would be a summary judgment motion that asked the court for specific relief of rolling back tax breaks for the rich. Is it legal for the management of public schools to be controlled entirely by the Superintendent of Public Instruction? It is not only legal, it is what the drafters of our State Constitution intended. 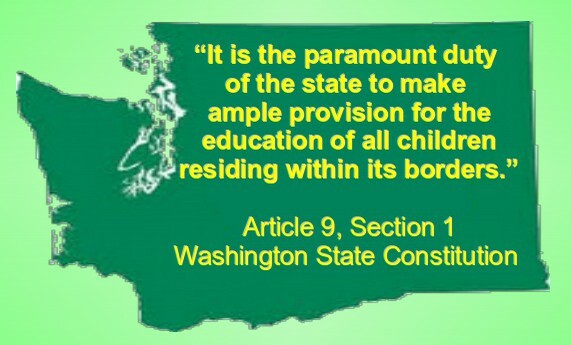 Article 9, Section 1 of the Washington State Constitution states: "It is the paramount duty of the state to make ample provision for the education of all children residing within its borders." Article 9, Section 2 states: "The legislature shall provide for a general and uniform system of public schools." Note that in both cases, the legislature is not given the right to manage or control public schools. The legislature is instead given the paramount duty to "make ample provision for" or "provide for" a general and uniform system of public schools. Put in plain English, the legislature must provide the revenue to fully fund public schools. But the legislature is not allowed to drive our public schools into the ground with impossible requirements and unfunded mandates. This point is made very clear in Article 2, Section 28 of the Washington state constitution which states: "The legislature is prohibited from enacting any private or special laws in the following cases... #15 Providing for the management of common schools. The reason for this provision in our state constitution was explained by those who wrote it as being needed to prevent a corrupt legislature from meddling with our public schools. This issue was further clarified in Article III, Section 22 of our State Constitution which states: "SUPERINTENDENT OF PUBLIC INSTRUCTION, DUTIES AND SALARY. The superintendent of public instruction shall have supervision over all matters pertaining to public schools." Note that the word "all" means that the drafters of our state constitution wanted the person elected by the voters to manage our public schools to have complete authority to manage all matters pertaining to our public schools. 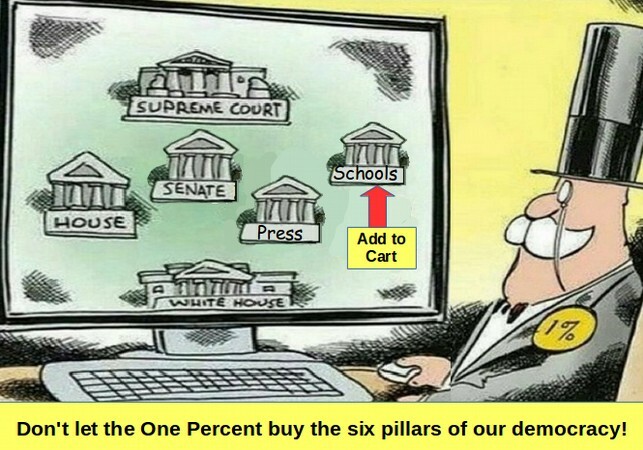 This system of a completely separate branch of state government to manage our public schools run by an elected Superintendent of Public Instruction was set up so that if things went badly with our public schools, the voters would know exactly who to blame and who to replace - one person - the Superintendent - rather than a pack of legislators each of whom would be pointing fingers and blaming everyone else. Sadly, for the past 20 years, weak superintendents have failed to enforce the state constitution. They have been nothing but rubber stampers for the billionaires who control our state legislature. This has led to an explosion of unconstitutional laws and unfunded mandates that have crippled our public schools. The solution to this problem is to place control over the management and funds for our public schools back in the hands of the State Superintendent of Public Instruction as intended by our state constitution. Even if the Supreme Court rules all tax breaks since 1996 to be unconstitutional, won't the extra $16 billion per year just go back to the General Fund under the control of the legislature? The Supreme Court certainly has the power to declare all tax breaks to be unconstitutional and void those laws. However, the Supreme Court also has the power to enforce every sentence in the Washington State Constitution. This includes the sentence "The superintendent of public instruction shall have supervision over all matters pertaining to public schools." All matters include not only policy matters but financial matters. Given that the McCleary lawsuit is confirmed that there is an inadequate level of funding for public schools and therefore a violation of the Paramount Duty clause, what the Supreme Court needs to consider is whether merely giving the $16 billion back to the state legislature rather than directly to the Superintendent would be an adequate remedy. The entire reason the drafters of our state constitution wrote an independently elected Superintendent of Public Instruction into our state constitution was because they were concerned about not only about the possibility of a corrupt legislature using bad policies to run our schools into the ground but also concerned about a corrupt legislature refusing to fund our public schools. It was the intention of the drafters of our constitution that the distribution of funds for public schools would be distributed to local school districts by an independently elected Superintendent of Public Instruction. Therefore, the only real remedy for the school funding crisis is for the state Supreme Court to place the extra $16 billion directly under the control of the elected Superintendent of Public Instruction. Anything less does not deal with the corruption problem in our state legislature. As time goes on, the Supreme Court is becoming increasingly aware that the legislature is refusing to comply with its orders. The fact that the legislature has refused to pay even the court ordered fine for not funding schools is evidence enough that the Supreme Court must take a stronger stance towards insuring that our schools are fully funded. This can only be assured by ordering the Department of Revenue to place the $16 billion under the direct control of the Superintendent of Public Instruction. Here is a clear example of what happens when we allow the corrupt legislature to ignore our state constitution and micromanage our public schools. Historically, teacher salaries were negotiated by local school boards in order to adjust for the cost of living within each school district. However, the state legislature has illegally imposed a state salary schedule which only pays school districts an extremely low amount for a "base teacher salary." Anything else has to come out of local levy funds - even though teacher salaries are clearly a part of basic education which is supposed to be paid for entirely by the state legislature. Our Supreme Court has specifically ruled that using local levy funds to pay for teachers is unconstitutional. Currently, the base salary for a starting teacher is about $35,000 per year. This meager salary is despite the fact that the average starting teacher spent 5 years getting their Teachers Certificate and incurred an average debt of more than $50,000. Who in their right mind would go $50,000 in debt and endure 5 years of training in order to get a job that only pays $35,000 per year? The answer is almost no one - which is why we now have a teacher shortage here in Washington State. The teacher shortage problem is entirely the legislature's fault. But it gets worse because after paying taxes and school loan payments, starting teachers typically have a take home pay of less than $2,000 per month. Now, there may be some places in Eastern Washington where a teacher can survive on $2,000 per month. But in King County, $2,000 a month does not even pay for rent, gas and food much less provide enough to buy a home and feed a family. This is why no college student wants to be a teacher any more and why we have a teacher shortage. You may have read that Governor Inslee wanted to raise the starting pay of teachers. The fact is that he only proposed raising their pay a mere 10 percent - to $40,000 per year. But even this meager raise was too much for corrupt legislators who insisted on not paying starting teachers even one more penny. 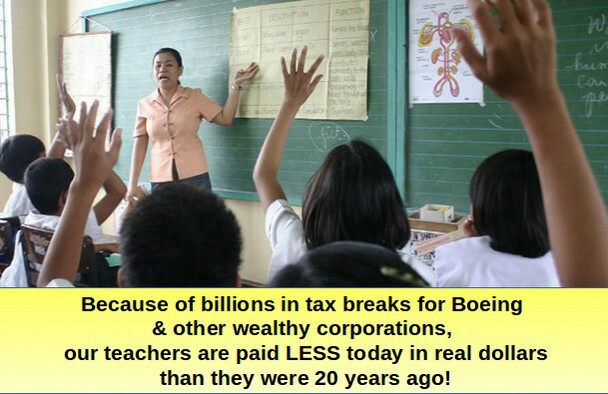 They are OK with giving billions of dollars to Boeing - but not one penny more to starting teachers. Here is another fact. A report commissioned by the legislature found that Washington teachers are among the lowest paid in the nation. The report recommended raising the starting pay of teachers in Washington state to $48,000 per year. This was 4 years ago and the legislature still has refused to change the illegal and unconstitutional state pay schedule. As bad as this situation is, imagine if the state legislature decided it needed to give even more money to Boeing and Microsoft and we needed to lower teacher salaries even more to pay for these new tax breaks. If we allow the corrupt legislature to set teacher salaries, they could lower the starting pay of teachers to $30,000 or even $25,000. 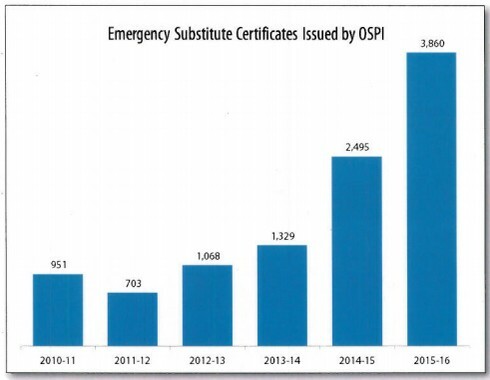 To address the teacher shortage resulting from extremely low pay, the legislature could issue "emergency substitute teacher certificates" to any babysitter with a pulse willing to work for peanuts. Oh. What a minute. The legislature already did this! The number of these emergency teachers has gone from about 1,000 just a couple of years ago to about 4,000 today. This is why the drafters of our state constitution prohibited the state legislature from passing any law regarding the management of our public schools. It is the same reason that the drafters of our state constitution put in the "Paramount Duty" clause. It was to protect our public schools from being harmed by a corrupt legislature. My daughter is in the 10th grade in the Snoqualmie Valley School District - the lowest funded school district in Washington state and one of the lowest funded and most overcrowded school districts in America. My daughter routinely has 35 kids in her classes. Once she had a class with nearly 100 kids in it. This year, she took an Algebra 2 class. The class was so over-crowded that after the first couple of weeks, the teacher told the kids they were falling too far behind and the kids were not allowed to ask any more questions. I told my daughter to keep asking questions. The class continued to fall behind. After 4 weeks, the teacher had a nervous breakdown and had to take time off. He was gone for the next three months. Due to the extremely low wages paid to teachers, the school district did not have a single qualified math teacher to replace him. So the kids had a series of "emergency substitute" babysitters who knew nothing about Algebra 2. The kids had to learn Algebra 2 with no help from anyone. I am a former math teacher and I spent several hours a night helping my daughter with her Algebra homework. Sometimes we were up until Midnight. The Emergency Teacher Law is not the only harmful law passed by our state legislature. There are literally hundreds of bad education laws passed every year by our legislature. In 2015 alone, the legislature passed 330 new laws - many of which micro-managed public schools. In addition to not paying teachers adequately, the legislature has created so many reporting requirements that the OSPI staff has exploded to almost 400 people. $15,868,000 of the general fund— 7 federal appropriation are provided solely for development and 8 implementation of the Washington state assessment system"
In other words, the legislature is paying about $40 million per year for an SBAC test that is not fair, not reliable, not valid and not predictive of anything - but is consuming months of time that should be spent helping struggling students learn. But this same legislature cannot fund any money to pay teachers a fair wage or lower class sizes! 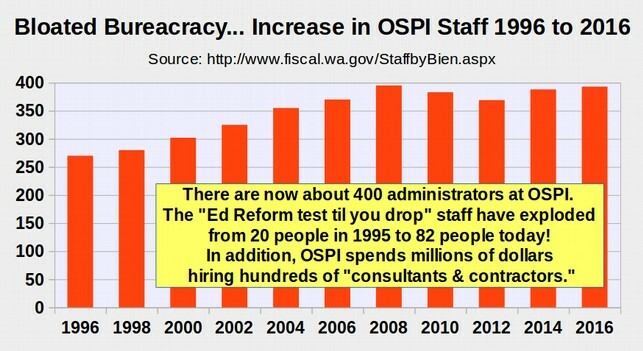 Fact #7: We need more teachers - not more tests or more bureaucrats in Olympia! If I am elected Superintendent, I will review each and every unconstitutional law and unfunded mandate that is illegally passed by our corrupt state legislature. This review will ask two important questions. First, did the legislature provide 100% of the actual cost of carrying out the new law? If they did not, I will give the legislature the opportunity to provide this funding. But I will make it clear that there will be no more unfunded mandates imposed on local school districts. Second, is the new law based on scientific research on child development? If not, I will give the legislature the opportunity to provide the research. But I will make it clear that our children are not their guinea pigs and will not be subject to any more ed reform schemes that are not supported by scientific research. My goal will be to cut the bloated bureaucracy at OSPI in half with the 200 positions transfered to hiring 200 more teachers in local school districts. Wealthy private schools understand the importance of small class size. 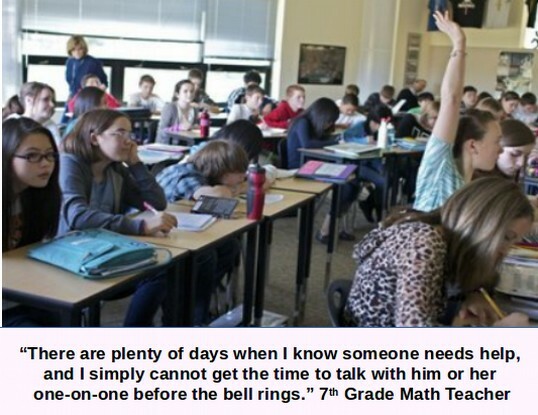 For example, at Lakeside Private School in Seattle, average class sizes are 16 students. If class sizes of 16 students is considered ideal for the children of the wealthy, these class sizes should also be available to all students in Washington state. As soon as the motion for summary judgment is granted, I will take the billions per year in tax breaks the legislature is robbing from our kids and give it back to school districts so we can reduce class sizes so struggling students can get the help they need to succeed in school and succeed in life. 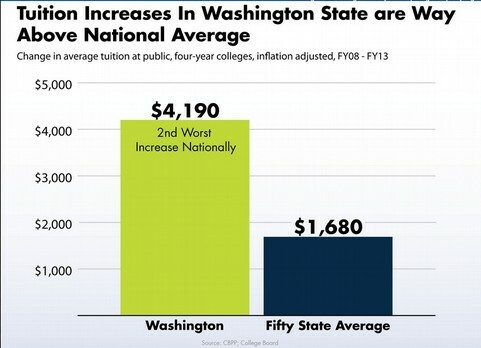 I will also take four billion per year the legislature is stealing from college students and not only lower college tuition back to what it was in 1996 - but provide every student in Washington state with four full years of higher education and/or vocational training - saving the average college student more than $12,000 per year. Despite the fact that post high school education is now required to get a good paying job in the modern economy, the legislature has gutted funding for high education just like they have gutted funding for public schools (all to pay for tax breaks for wealthy corporations). 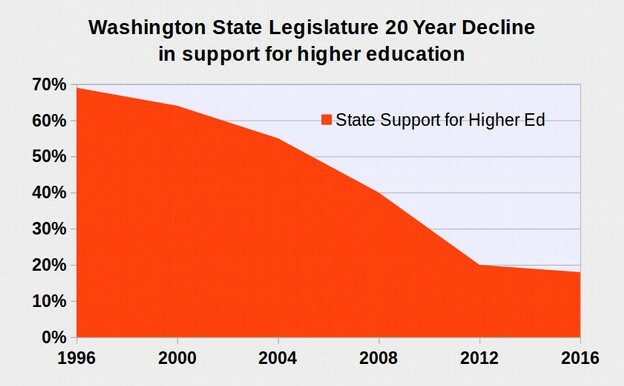 Restoring funding for higher education and public schools is not only the legal thing to do to comply with our state constitution, it is also the right thing to do economically as it would pump $16 billion per year back into Washington's local economy - creating more than 160,000 public sector jobs and more than 320,000 private sector jobs for a total of 480,000 urgently needed new good paying full time jobs. Right now, over half of all young adults under the age of 25 can not find a living wage job. If I am elected, we will put them all back to work. There are several reasons I hope you will join and support our campaign. First, I am the only candidate who has proposed a solution to the school funding crisis. Not only have none of the other candidates for Superintendent proposed a funding solution, but no one in Olympia other than me has drafted a bill to provide the $9 billion per year needed to meet our State's obligations required by our State Constitution and our State Supreme Court. Since the legislature refuses to repeal even one of their precious tax breaks to fund our schools, if I am elected I will file a motion for summary judgment asking the court to repeal every illegal tax break passed since 1996. It is contrary to our state constitution for the legislature to be passing all of these tax breaks and then paying for the tax breaks by gutting funding from our public schools. If the Supreme Court grants an expedited review, we could have school funding restored in our state within 6 months of the day I take office! Second, I am the only candidate who has provided a way to cut class sizes in half as well as raise teacher pay to a respectable living wage so we can end the current teacher shortage. Instead of continuing year after year to force our kids to endure the highest class sizes in the nation, we will give them the lowest class sizes in the nation. 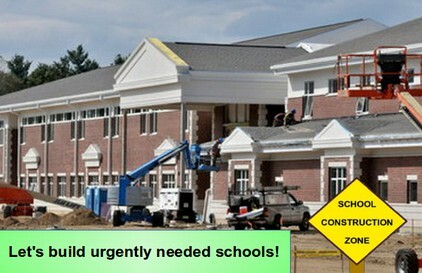 Third, I am the only candidate who has provided a solution to the school construction crisis. To address the $40 billion school construction backlog, I will use one billion dollars per year to start a public bank in Washington state. A State Bank will cut the cost of building urgently needed schools in half as our schools will no longer need to make interest payments to Wall Street banks. My plan will provide funding to build more than 100 new schools every year for a total of 1,000 new schools over 10 years and provide every student in our State with a safe & healthy school while cutting property taxes in half and cutting class sizes in half. In addition to filing a motion to restore school funding by rolling back tax breaks, I will also file a motion to order the legislature to pay for the entire cost of building 1,000 new schools. This would not only bring the legislature to the bargaining table, it would also finally get us a public bank because this would be the cheapest way to pay for 1,000 urgently needed new schools. Fourth, I am the only candidate with a plan to fully fund four full years of free higher education or vocational training for every high school graduate in Washington state. This will help hundreds of thousands of students in Washington state get the training they need to get a good paying job without incurring tens of thousands of dollars of debt. Rolling back $16 billion in corporate tax breaks will provide $8 billion for school funding, $4 billion for school construction & $4 billion for college funding. Together these three programs, funding school operations, school construction and increased access to higher education will create more than 480,000 urgently needed new jobs simply by requiring billionaires and wealthy corporations to pay their fair share of state taxes. It will be the biggest economic boom in the history of our state! Fifth, I am the only candidate who has a plan to end child homelessness and by providing a warm cozy home for all 80,000 homeless children in Washington state. All kids need a stable home if they are to succeed in school and succeed in life. While 80% of Washington Students with homes graduate, only 50% of homeless students graduate from high school. 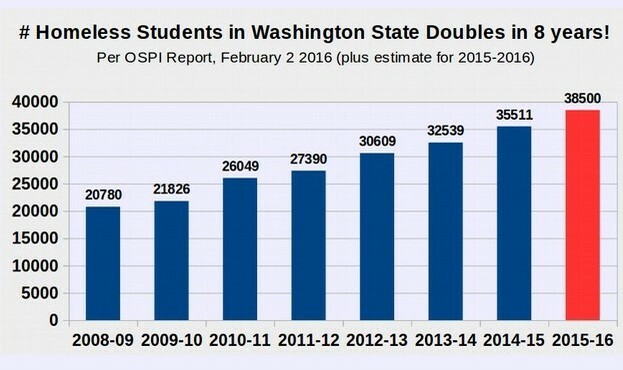 Yet the number of homeless students in Washington state has been rising dramatically in the past 20 years. The McKinney-Vento Act, requires all school districts to report annually the number of homeless students enrolled in schools. The Washington Superintendent of Public Instruction then uses these school district reports to compile a state report each year. The latest OSPI report stated that the number of homeless students for the 2014-2015 school year was 35,511. Since this number is rising by about 3,000 students per year in our state, the number of homeless students for the current 2015-2016 school year is about 38,500 students. However, this report greatly underestimates the true number of homeless children in our state for several reasons. First, it does not include young children who are not yet in school. Since these are about one quarter of all children, the total number of homeless students is greater than 60,000. Second, many families do not want to admit that they are homeless. "We estimate that in mid-2011, 1.65 million households with 3.55 million children were living in extreme poverty in a given month, based on cash income. This constituted 4.3 percent of all households with children... The prevalence of extreme poverty rose sharply between 1996 and 2011, with the highest growth rates found among groups most affected by the 1996 welfare reform act." Using 4.3 percent as an estimate of the percent of homeless students in Washington State in 2011, this would indicate that there were about 44,000 homeless students among Washington's one million students in 2011. This is 60% greater than the OSPI estimate of 27,390 students for 2011. Adding 60% to the current school year number of 38,500 makes the actual number of homeless students about 61,600 students. Adding in the young children not yet in school brings the total number of homeless children in Washington state to about 80,000 children. This is more than double the estimate from OSPI. I will restore the $380 million cut to the Washington State Working Connections program in 2011 that tossed more than 15,000 low income children and their parents out on the street. In addition, I will use at least one billion dollars of the ten billion dollars in repealed tax breaks for the rich to provide stable housing for all 80,000 homeless children in Washington state and also provide a real job training program for their parents. This program will cost about $12,000 per year per homeless family. However, the cost savings to tax payers by increasing the graduation rate of these students from 50% to 80% will be many times greater than the cost of providing housing to these extremely low income families. Sixth, I am the only candidate with a plan to lower local property taxes by reducing the unconstitutional over-reliance on local levies. I will take one billion per year that the legislature is stealing from local homeowners and lower their property taxes back to what they were in 1996 - cutting school related local property taxes in half and saving the average family more than one thousand dollars per year. Seventh, I am the only candidate who will end High Stakes Testing to return to real learning & allow more time for lunch, recess, music, history & and other important subjects. Eigth, I am the only candidate who will increase the Graduation Rateby ending unfair high stakes tests as a graduation requirement. Ninth, I am the only candidate who will restore GED fairness for tens of thousands of low income students in Washington who are currently being denied a high school equivalency certificate. Without this certificate, these low income kids cannot get a job or go to college. Many wind up committing major crimes and filling our prisons at a huge cost to tax payers. This insane policy of denying students a fair GED test has to end. Tenth, I am the only candidate who will end unfunded mandates & return control of schools to local communitiesby ending Common Core Tests & Curriculum written by Wall Street Consultants instead of teachers. We will return to Washington state standards written by Washington state teachers. Twelfth, I am the only candidate who will clean up Olympia & build a grassroots political coalition to fully fund our public schools. Submitting a summary judgment motion is only a short term solution to our school funding crisis. The long term solution is to clean up the corruption in Olympia. We need to replace at least a few corrupt politicians to convince the rest that they will need to fund our schools and say no to any more tax breaks to stay in office. To elect more responsible state leaders, what parents and teachers need is an accurate source of information about what is really going on in Olympia. I will provide parents and teachers with a "Paramount Duty Report Card" so voters who care about our schools can learn the truth about who really supports schools and who claims to support schools but really simply robs from schools. We will send every Senator, Representative and Candidate for the State legislature a questionnaire asking them how they will fund our public schools. We will then post their answers along with an analysis of every school funding bill on the OSPI website. We have a school report card to learn the truth about our schools. I will use the Superintendent's office as an independent and objective source to expose corruption, clean up Olympia and restore school funding here in Washington State. There are many more reasons to support our campaign. Find out more about these issues by visiting our website: springforbetterschools.org. Fact #8: This Election Is Extremely Important! There is a tendency to think that the election for Superintendent is not that important. However, this failure to understand the importance of this office is one reason our school funding has fallen to among the lowest in the nation in the past 20 years. Here are just a few of many reasons why this election is extremely important. This election is about the long term needs of our children versus the short term greed of multinational corporations.This election will determine whether we restore school funding by rolling back corporate welfare so our children can have a fair chance at success in life – or continue to do nothing but suffer in silence as thousands of teachers quit in disgust and the futures of one million children are put at risk. This election will determine whether we will rebuild our crumbling public schools and restore our crippled economy - or continue to risk the health and safety of our kids in schools that do not meet the health codes or earthquake codes. This election will determine whether we demand that the rich pay their fair share so we can lower taxes on middle class families by more than $1,000 per year – money they will spend at local businesses to jump start our economy – or instead continue to do nothing and stay with our current extremely unfair tax structure which essentially robs local homeowners and robs or children to pay for tax breaks to the rich. This election will determine whether we rein in political corruption in Olympia by ending corporate kickbacks to political campaigns - or continue to do nothing while corporate lobbyists bribe our State legislature, outsource our jobs, rob middle class families and drive our economy over a financial cliff. We must all realize that it will not be easy to win this election. The billionaires will not go quietly into the night and start paying the $11 billion per year they are currently robbing from our kids and our families just because it is the right thing to do. The wealthy like their billions of dollars in tax breaks. They like the fact that they pay state taxes at a rate that is one tenth the rate of the poor and the working class. They do not care about the future of our kids. They do not even care about the future of our economy. All they care about is money. Fact #9: With Your Help, We Can Win This Election! It is up to us to protect our kids from the greed of the very rich. Our kids cannot afford 4 more years of excuses, and gridlock and high class sizes and tax breaks for the rich. This is where you come in. We outnumber the billionaires by a million to one. If we all join together and reach out to our friends and neighbors, we can and will win this election. We need to recognize that the urgent problems facing our schools will not be solved by re-electing the same group of corrupt politicians and rubber stamping Olympia Insiders who created these problems in the first place. It is time to elect someone who will challenge the status quo and clean up the corruption in Olympia. If we are to win, we need more than your vote. We need your help. We need every parent, teacher and person who cares about our kids and our schools to play an active roll in building a coalition to bring real change to our public schools and real hope to students. If you have had enough of corporate corruption, it is time to join our campaign! Democracy is not a spectator sport. It is up to each and every one of us to stand up and declare that we’ve had enough of the insider-run big money politics that rules Washington State. Democracy depends on each of us get involved. Real change will never come from the top. Real change has to come from us - from parents and teachers and concerned citizens. This is our election. We can win this year and rebuild our economy and restore our democracy. But we need your help to do it. There is a great deal you can do to help. The first step is to learn more about the actual underlying causes of our school funding crisis and what can be done to restore a full school funding. On the following pages, we will summarize many of the problems created by the corporate takeover of our schools. We then describe solutions to each of these problems. The next step is to call or email your friends and neighbors. Encourage them to visit our website and learn more about our Plan to Immediately and Fully Fund our Public Schools. Sign up for our email list to receive updates on our campaign. Volunteer to go door to door in your community. Donate to our campaign if you can. Host a community house party or schedule a meeting at your local library. We will come to your community, share ideas and answer questions about how to fund and improve our schools. Post a link to our website on your Facebook page. Put up some yard signs. Build your own community education funding group. Together we can and will restore sanity in Olympia, roll back these illegal tax breaks and restore school funding and a better future for every child in our state. Each morning in our schools, our children pledge themselves to a nation with Liberty and Justice for All. This goal is within our reach - but only if we move away from a corrupt political system based on corporate greed. This election you get to decide which is more important … the long term unmet needs of our kids for fully funded public schools - or the short term unchecked greed of wealthy multinational corporations. Feel free to email us if you have any questions, comments, concerns or advice. We are here to serve you and we look forward to meeting you. #1 Full State Funding of School Operations by filing a Summary Judgment motion to roll back tax breaks for billionaires and wealthy corporations. #2 Cut class sizes in half by raising the pay for teachers and hiring more teachers. 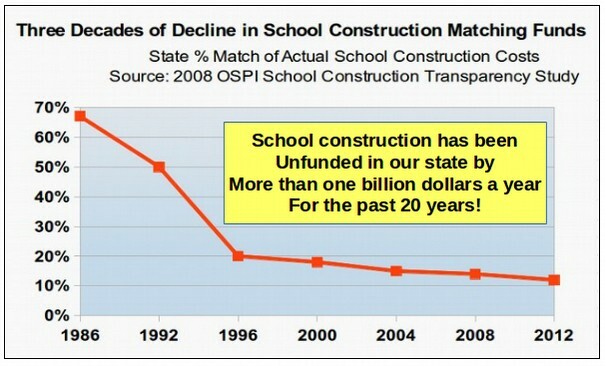 #3 Full State Funding of School Construction... Build 1,000 new schools to end over-crowding and provide every student with a safe and healthy school. #4 Provide Every Student with Four Years of Free College or Vocational Training. #5 Provide housing for all 80,000 homeless children in Washington state. Restore the $380 million cut to the Washington State Working Connections program in 2011 that tossed more than 15,000 low income students and their parents out on the street and use one billion dollars to provide every homeless child in our state with a stable home. #6 Lower local property taxes by reducing the unconstitutional reliance on local levies. #7 End High Stakes Testing to return to real learning & allow more time for Lunch, Recess, Art, Music, History and other important subjects. #8 Increase the Graduation Rate by ending unfair high stakes bubble tests as a graduation requirement. #9 Provide at risk students with more support & a Fair GED Test. 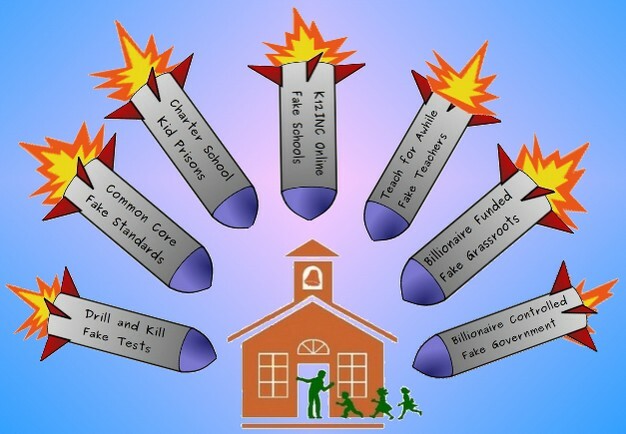 #10 End unfunded mandates & return control of schools to local communities by ending Common Core Tests & Curriculum written by Wall Street Consultants. #12 Clean up Olympia & build a grassroots political coalition to fully fund our public schools. I will use the Superintendent's office as an independent and objective source to expose corruption, clean up Olympia and restore school funding here in Washington State.